Pembrey Circuit graphic decal / sticker. 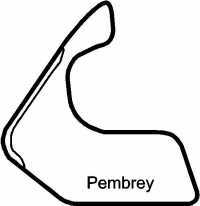 Pembrey Circuit is a racing circuit outside Pembrey village, south Wales. It is deemed to be the home of Welsh motorsport, providing racing for cars, motorcycles, karts and trucks. The circuit's facilities have also been used for a single venue rally.